With the age of YouTube and other social media, some hairdressers and stylists feel they can offer hair extensions just by watching a video and purchasing a kit. These videos are not necessarily bad – some do offer a visual refresher on application, but they lack the knowledge of overall placement and customization. 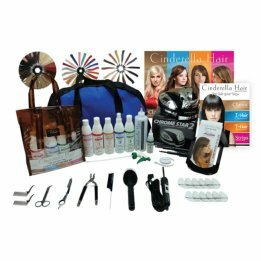 With Cinderella Hair Extensions® Hands-on Training you will remember material better, retain information and within this environment you will achieve a sense of accomplishment. You will be able to transfer your hair extensions training easier and more professionally to your client and offer them the proper extension application method that is best for their lifestyle. Our educators have an interaction with each attendee and we integrate this hands-on environment with real skills hairdressers need – in real life situations. Upon completion of our 2 Day/6 Methods/16 Hour Hands-on Training Seminar you will be certified in Cinderella Hair Extensions. You will be able to add additional services to your salon menu and be automatically enrolled in our Client Referral Program upon your certification. You can now offer chemical-free color, volume and length. From special occasions and social events to school rallies and theatrical venues – it’s all Our Hair Your Way! Classic Bond Hair Extensions are the most popular hair extension application method which sets the foundation of hair extension artistry. Under the close supervision of one of our Cinderella Hair Instructors, you will learn how to cut our organic bond in half when working with fine hair or in areas where the bonds need to be more discrete. You will also learn how to customize and place the bond in areas that will give your clients natural looking length, color and volume lasting 4 - 6 months. I-Hair® I-Tip Extensions are a single strand method and uses no heat to apply. You will learn the correct way to use our 2 in 1 Hook/Loop Tool to apply both the I-Link and I-Hair and how to secure/remove the hair extension with the Application/Removal Tool. With proper application and client maintenance I-Hair will last 4 - 6 months and the hair is reusable. Cinderella Hair Extensions Flat Tip I-Hair® attachment method designed to lay flat against the scalp giving you instant length and color. Flat Tip I-Hair is virtually undetectable offering you even weight distribution and attached with Small Silicone I-Links®. There is no heat involved and the hair is completely reusable. Each Flat Tip I-Hair is 1/4" (0.6cm) wide giving you double the hair coverage of standard strand-by-strand methods. T-Hair® Tape Extensions are uniquely designed to be applied to your client's hair in such a way that the hair is "sandwiched" between (2) reusable 1½" wide sections and secured in place with our T-Hair Sealer. You will learn customized sizing for placement virtually anywhere by cutting each piece of T-Hair. 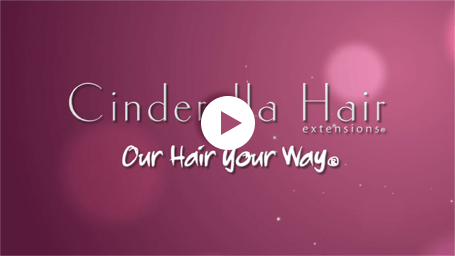 Cinderella Hair Strips® are designed to give volume and length in about an hour or less. Each Strip is 3" wide and secured in place with I-Links and can be worn for 6 - 8 weeks then readjusted/reused during your client's next visit. You will learn both basic and crisscross application methods. Cinderella Hair® Veil is made of 100% Human Remy Hair which naturally looks and feels like your own hair. The Cinderella Hair Veil is secured to a very thin 30" wide polyurethane base giving you the flexibility to customize sizing from the nape up to the crown of the head. 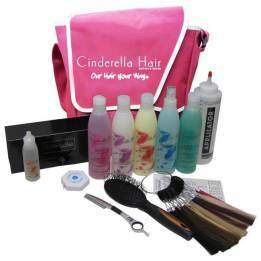 Use Silicone I-Links to attach the Cinderella Hair Veil and fold over the top layer of hair to cover the I-Links. Your hair will look, feel and move naturally! In-Salon Training is available to any licensed cosmetologist and salons (minimum 6 stylists) within the United States and Canada. For additional information call 1-800-332-9246 Monday – Friday 8AM – 5PM PST and speak to one of our Seminar Specialists or use our Contact Tab on the top of this page.